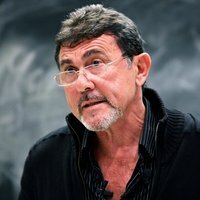 Shlomo Sand is professor of history at Tel Aviv University and author of the controversial book The Invention of the Jewish People (Verso Books, 2009). His main areas of teaching are nationalism, film as history and French intellectual history. He declined an offer by the Israeli Communist Party Rakah to be sent to do cinema studies in Poland, and in 1975 Sand graduated with a BA in History from Tel Aviv University. From 1975 to 1985, after winning a scholarship, he studied and later taught in Paris, receiving an MA in French History and a PhD for his thesis on "George Sorel and Marxism". Since 1982, Sand has taught at Tel Aviv University as well as at the University of California, Berkeley and the École des hautes études en sciences sociales in Paris.